We are an expanding vehicle body shop, established in 1992. We provide customers with the complete vehicle bodywork solution, from accident damage to small bumper scuffs and paintless dent repairs, and encompassing everything in-between. We are based in a purpose built body shop in Warrington, Cheshire. We pride ourselves on our excellent quality and professional customer service. Each job is carried out to the same high standard, using state of the art equipment, by our team of professionals. Learning our craft in the prestige car bodywork repairs has given us a dot the i’s and cross the t’s approach to car body repairs and refinishing. So whatever your vehicle and situation, you can be sure it will receive the same care and attention that has always gone into our car body repair and re-spray work. Our bodyshop provides a service second to none, whether it is accident damage affecting several panels or those irritating scuffs and scratches. We can repair any part of the car body from bonnet to boot, including wheel arches and alloy wheels. We can carry out an express repair with our panel beating service and have you back on the road the same day. We can spray your car or van in our specialised paint booth to provide that perfect finish, including metallic paint. Whether it is a whole body re-spray or just one panel, with our own mixing facilities we can guarantee a perfect colour match. Thus we ensure that your vehicle leaves our bodyshop with the perfect finish. Even if you need paintless dent repair, which is sometimes referred to as PDR, then our dent man can repair that too, so long as it isn’t full panel damage. This provides cheap affordable bodywork repairs for those minor dings and dents. For the prestige car owner, we can look after any body repairs that need doing, big or small. Those Stone chips in the bonnet or scratches to the boot lid or tailgate need no longer be a worry. We can repair minor dents or alloy wheels for a very reasonable price and still do a better job than a mobile repairer or smart repair man can do. We tackle all makes of car and van including Ford, Vauxhall, Audi, and VW. Prestige cars are a speciality and we welcome owners of Mercedes, Lexus, BMW, Range Rover and Jaguar. Equally we are very popular with Skoda, Seat, Daewoo and Hyundi owners. 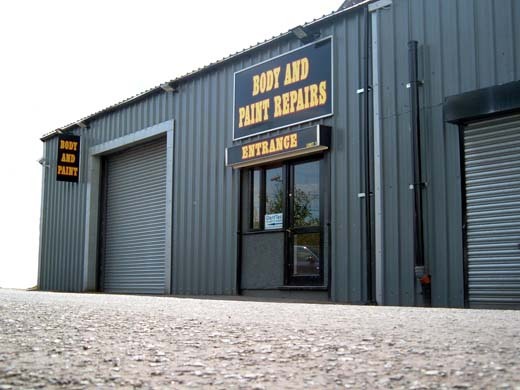 Here at Body and Paint Repairs, it is our wish that all visitors to our website have a helpful and rewarding experience. We are only too aware that some individuals have various forms of visual impairment.